← Interview with Author Alyssa Helton and a Giveaway! Do you feel worthless? Do you feel unloved? Do you think that you have no value in this life? Do voices whisper in your ear the lies that you’re ugly and unappreciated? 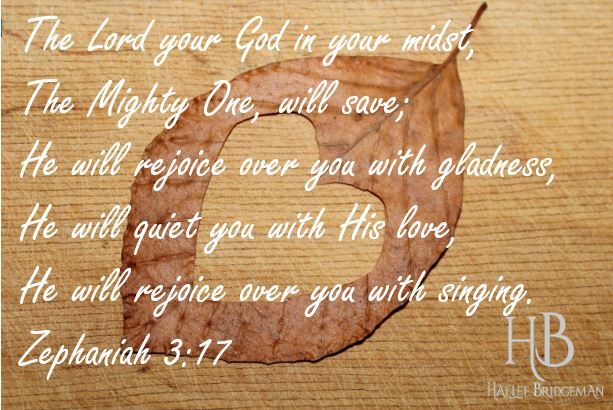 Beloved, The Mighty One loves you! He is in your midst. Think about that! The Creator of the Universe, who knows the placement of every speck of sand of every beach in every planet in every galaxy is in YOUR midst. You are not alone and He KNOWS you! He will save. And He will rejoice with you! We were made in His image, and He has gifted us and equipped each of us in abundance so that we can grow even closer to Him. Throughout scripture we can see ourselves reflected back the way God sees us! Take those truths forward and let them speak to you and drown out the lies of worthlessness and insignificance. Cling to this knowledge and rise from the ashes to see your true beauty and refinement. This entry was posted in Blog, Devotional Writings and tagged devotional thought, devotional writings, god in our midst, loved, wonderfully made, word of promise, zephaniah. Bookmark the permalink.